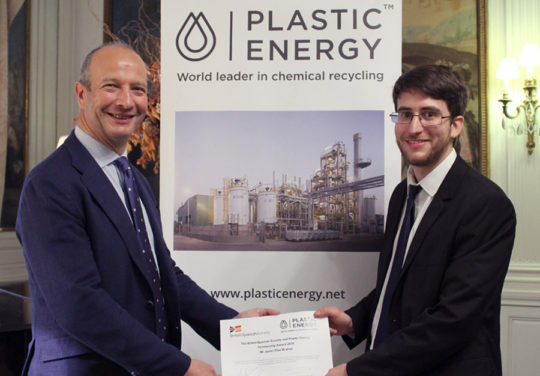 Carlos Monreal, PLASTIC ENERGY Founder and Chief Executive Officer, presented the Plastic Energy Scholarship Award 2018 to Javier DÍAZ BRAÑAS, PhD in Applied Mathematics at the University of Lincoln. His project is Cell Dynamic Simulations of Block Copolymer Nanocomposites. Javiar’s teaching experience includes: [2016-Present] Assistant demonstrator on Computer Algebra (MATLAB and Maple). [2017-2018] Teaching duties on Computational Fluid Dynamics (with ANSYS fluent). The nature of the project is as follows: Block Copolymers are macromolecules composed of groups of different repeated units. In the simplest case, diblock copolymers can self- assembly into periodic ordered structures in the mesoscale, and its morphology and overall properties can be modified by the presence of nanoparticles. He wants to study the effect that nanoparticles have on the block copolymer nanocomposite overall morphology, as well as the assembly of colloids. Complex systems such as anisotropic nanoparticles will also be examined.